2018 Porsche Macan.Porsche Pre-Paid Maintenance Included. 18" Macan S Wheel, Lane Change Assist, Panoramic Roof System, Porsche Connect, 8-Way Power Seats, Heated Seats. Build Sheet Available Upon Request. We would be happy to answer any questions you may have. Stop by our dealership or give us a call for more information. Porsche Certified 2018 Macan. 18" Macan S Wheel, Lane Change Assist, Panoramic Roof System, Porsche Connect, Wheel Center Caps with Colored Porsche Crest. Build Sheet Available Upon Request. We would be happy to answer any questions you may have. Stop by our dealership or give us a call for more information. 2018 Porsche Certified Macan. Porsche Pre-Paid Maintenance Included. Panoramic Roof System, Porsche Connect, Porsche Entry & Drive, Lane Change Assist, 18" Macan S Wheel, 8-way Power Seats, Seat Heating, Steering Wheel Heating Build Sheet Available Upon Request. We would be happy to answer any questions you may have. Stop by our dealership or give us a call for more information. 2018 Porsche Certified Macan. Porsche Pre-Paid Maintenance Included. Premium Package Plus, 19" Macan Design Wheels, BOSE Surround Sound System, Lane Change Assist, Navigation Module for Porsche Communication Management, Porsche Connect Plus, Porsche Dynamic Light System, 14-Way Power Seats with Memory Package, Roof Rails in Black, Trailer Hitch without Tow Ball, Wheel Center Caps with Colored Porsche Crest. Stop by our dealership or give us a call for more information. 2018 Porsche Certified Macan Sport Edition. 20" RS Spyder Design Wheels, 18-Way Adaptive Sport Seats with Memory Package, Air Suspension, Porsche Active Suspension Management, Premium Package Plus, Auto-Dimming Interior Mirrors, Auto-Dimming Side Mirrors, LED Headlights, Porsche Dynamic Light System Plus, Bose Sound System, Lane Change Assist, Roof Rails in Black, Sport Exhaust System Tailpipes in Black, Heated Steering Wheel, Porsche Connect, Navigation System, Sun-blind for Rear Side Windows. Build Sheet Available Upon Request. We would be happy to answer any questions you may have. Stop by our dealership or give us a call for more information. 2018 Porsche Certified Macan Sport Edition. Premium Package Plus, Burmester High-End Surround Sound System, 20" RS Spyder Design Wheels in Black, Air Suspension, Porsche Active Suspension Management, Auto-Dimming Mirrors, Lane Change Assist, 14-Way Power Seats with Memory Package, Sport Exhaust System Tailpipes in Black Build Sheet Available Upon Request. We would be happy to answer any questions you may have. Stop by our dealership or give us a call for more information. 2018 Porsche Certified Macan Sport Edition. Premium Package Plus, 20" RS Spyder Design Wheels, Air Suspension, Porsche Active Suspension Management, Porsche Dynamic Light System Plus (PDLS+), Auto-Dimming Interior Mirrors, LED Headlights, 14-Way Power Seats with Memory Package, Sport Exhaust System Tailpipes in Black, Porsche Connect, Navigation System, Bose Sound System. Build Sheet Available Upon Request. We would be happy to answer any questions you may have. Stop by our dealership or give us a call for more information. 2018 Porsche Certified Cayman S. Porsche Pre-Paid Maintenance Included. 20" Carrera S Wheels, Porsche Navigation System, Premium Package, Seat Ventilation, BOSE Surround Sound System, Bi-Xenon Headlights with Porsche Dynamic Light System, Door Handles in High Gloss Black, Instrument Dials in White, Interior Trim in Carbon, Porsche Connect Plus, 14-Way Power Sport Seats with Memory Package, Rear Logos Painted, Rear Wing in High Gloss Black, Wheel Center Caps with Colored Porsche Crest, Wheels Painted in High Gloss Black. Build Sheet Available Upon Request. We would be happy to answer any questions you may have. Stop by our dealership or give us a call for more information. Clean CARFAX. Selenite Gray Metallic 2019 Mercedes-Benz C-Class C 300 RWD 9-Speed Automatic 2.0L I4 Turbocharged 10.25" Center Display, Android Auto, Apple CarPlay, Blind Spot Assist, Burmester Premium Sound System, Electronic Trunk Closer, Exterior Parking Camera Rear, HANDS-FREE ACCESS, HANDS-FREE Comfort Package, Heated Front Seats, Inductive Wireless Charging w/NFC Pairing, KEYLESS GO®, Panorama Sunroof, Power moonroof, Premium Package, SiriusXM Satellite Radio, Wheels: 18" Multispoke w/Black Accents. Baker Motor Company of Charleston was founded in 1988 by Tommy B. Baker and is the largest privately held automobile dealer group headquartered in South Carolina. 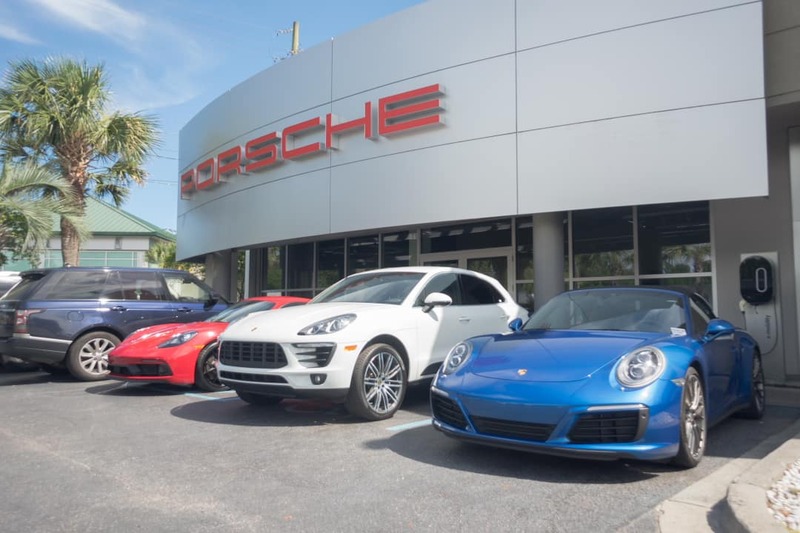 The company operates manufacturer-authorized, new car dealerships representing 12 brands including Porsche, Rolls-Royce Motor Cars, Mercedes-Benz, Sprinter, smart, INFINITI, Maserati, Jaguar, Land Rover, Buick, GMC, and Cadillac. The company also operates two high-line pre-owned centers, a reconditioning center, and a full service, USAA and State Farm Insurance-approved collision repair center. Recent Arrival! Odometer is 8120 miles below market average! 23/34 City/Highway MPG Call 843-996-1452 for more information on this vehicle! Clean CARFAX. Polar White 2019 Mercedes-Benz GLC GLC 300 4MATIC® 4MATIC® 9-Speed Automatic I4 4-Way Lumbar Support, Android Auto, Apple CarPlay, Automatic temperature control, Blind Spot Assist, Burmester Surround Sound System, Electrically Adjustable Passenger Seat, Exterior Parking Camera Rear, Front dual zone A/C, Heated Front Bucket Seats, KEYLESS GO®, Memory seat, Panorama Sunroof, Power driver seat, Power Driver Seat & Steering Column w/Memory, Premium Package, SiriusXM Satellite Radio, Smartphone Integration, Smartphone Integration Package, Split folding rear seat, Telescoping steering wheel, Tilt steering wheel, Wheels: 19" AMG Twin 5-Spoke w/Grey Accents. Baker Motor Company of Charleston was founded in 1988 by Tommy B. Baker and is the largest privately held automobile dealer group headquartered in South Carolina. The company operates manufacturer-authorized, new car dealerships representing 12 brands including Porsche, Rolls-Royce Motor Cars, Mercedes-Benz, Sprinter, smart, INFINITI, Maserati, Jaguar, Land Rover, Buick, GMC, and Cadillac. The company also operates two high-line pre-owned centers, a reconditioning center, and a full service, USAA and State Farm Insurance-approved collision repair center. Recent Arrival! 22/27 City/Highway MPG Call 843-996-1452 for more information on this vehicle! Black 2019 Mercedes-Benz GLC GLC 300 RWD 9-Speed Automatic I4 19" 5-Spoke Wheels, Ambient Lighting (3 colors), Burmester Surround Sound System, HANDS-FREE ACCESS, HANDS-FREE Comfort Package, Heated front seats, KEYLESS GO®, Navigation System, Panorama Sunroof, Parking Assistance Package, Parking Package, PARKTRONIC w/Active Parking Assist, Power Liftgate, Premium Package, SiriusXM Satellite Radio, Static LED Headlamps, Surround View Camera System. Baker Motor Company of Charleston was founded in 1988 by Tommy B. Baker and is the largest privately held automobile dealer group headquartered in South Carolina. The company operates manufacturer-authorized, new car dealerships representing 12 brands including Porsche, Rolls-Royce Motor Cars, Mercedes-Benz, Sprinter, smart, INFINITI, Maserati, Jaguar, Land Rover, Buick, GMC, and Cadillac. The company also operates two high-line pre-owned centers, a reconditioning center, and a full service, USAA and State Farm Insurance-approved collision repair center. Recent Arrival! 22/27 City/Highway MPG Call 843-996-1452 for more information on this vehicle! Clean CARFAX. Black 2019 Mercedes-Benz C-Class C 300 RWD 9-Speed Automatic 2.0L I4 Turbocharged 10.25" Center Display, Android Auto, Apple CarPlay, Automatic temperature control, Blind Spot Assist, Burmester Premium Sound System, Electronic Trunk Closer, Exterior Parking Camera Rear, Front dual zone A/C, HANDS-FREE ACCESS, HANDS-FREE Comfort Package, Heated Front Seats, Illuminated entry, KEYLESS GO®, Live Traffic, Memory seat, Power driver seat, Power moonroof, Power passenger seat, Premium Package, Rain sensing wipers, Remote keyless entry, SiriusXM Satellite Radio, Telescoping steering wheel, Tilt steering wheel, Wheels: 18" Multispoke w/Black Accents. Baker Motor Company of Charleston was founded in 1988 by Tommy B. Baker and is the largest privately held automobile dealer group headquartered in South Carolina. The company operates manufacturer-authorized, new car dealerships representing 12 brands including Porsche, Rolls-Royce Motor Cars, Mercedes-Benz, Sprinter, smart, INFINITI, Maserati, Jaguar, Land Rover, Buick, GMC, and Cadillac. The company also operates two high-line pre-owned centers, a reconditioning center, and a full service, USAA and State Farm Insurance-approved collision repair center. Recent Arrival! 23/34 City/Highway MPG Call 843-996-1452 for more information on this vehicle! Clean CARFAX. Black 2019 Mercedes-Benz E-Class E 300 RWD 9-Speed Automatic I4 19" AMG® Twin 5-Spoke Wheels, Adaptive Highbeam Assist, AMG Line Exterior, AMG® Body Styling, Android Auto, Apple CarPlay, Automatic temperature control, Burmester Surround Sound System, Center Console in Black Piano Lacquer, Comfort Box, Electric Trunk Closer, Exterior Lighting Package, Exterior Parking Camera Rear, Front dual zone A/C, Hands-Free Access, HD Radio w/SIRIUS Satellite & Real-Time Traffic, KEYLESS GO Comfort Package Code, KEYLESS GO®, LED Intelligent Light System, Memory seat, NFC Wireless Charging, Panorama Roof, Perforated Front Brake Discs & Fr Brake Calipers, Power driver seat, Power moonroof, Power passenger seat, Premium 1 Package, Radio: COMAND Navigation, Rain sensing wipers, Rear Spoiler, Security system, SiriusXM Radio, Sport Interior, Sport Interior (P15). Baker Motor Company of Charleston was founded in 1988 by Tommy B. Baker and is the largest privately held automobile dealer group headquartered in South Carolina. The company operates manufacturer-authorized, new car dealerships representing 12 brands including Porsche, Rolls-Royce Motor Cars, Mercedes-Benz, Sprinter, smart, INFINITI, Maserati, Jaguar, Land Rover, Buick, GMC, and Cadillac. The company also operates two high-line pre-owned centers, a reconditioning center, and a full service, USAA and State Farm Insurance-approved collision repair center. Recent Arrival! 21/30 City/Highway MPG Call 843-996-1452 for more information on this vehicle!